Notice how the 5 large sides are slightly concave, bringing in a very powerful & somewhat more feminine energy. In dream crystals, the number of sides indicated means number of concave sides. 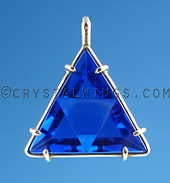 Dream Crystals (also known as 'Phi Crystals') are known as the Hope Diamond of Quartz. They are considered the most powerful and valuable. This is because of their concave sides (view picture at left). Unlike traditional Authentic Vogel Crystals, or Master Healing Wands, Dream Crystals have facets that dip in, creating a speed and momentum of energy never before experienced. 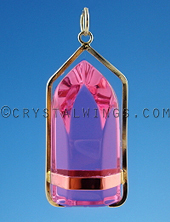 Clients have said that Dream Crystals have created a expansive effect in their practice. The Dream Crystals seem to be an elite force in energy work - diving in and pushing our perceived limits. They are called 'Dream' Crystals because the technology and science to sculpt them was received in a dream after Marcel Vogel's passing. It is thought that he left this planet before he was able to integrate this new configuration. Now they are at our disposal for our work, our journey, our earth walk. Why Work With These Crystal Wands? 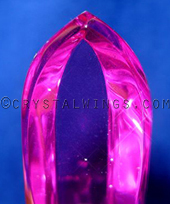 All of the Crystal Wands and Master Healing Tools that are provided by Crystal Wings are the most refined, advanced, and powerful pieces available on this planet. 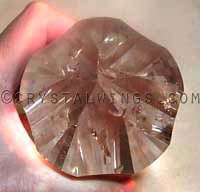 The founder of Crystal Wings was certified by Marcel Vogel himself, and thus understands the integrity of sacred geometry, science, and specific blue prints that are integrated for crystal beings that can journey with you and illuminate your experience for a lifetime. It is not necessarily important to know the details about Marcel Vogel, about how much time, energy, and spiritual knowledge and physical skill it takes to create such tools. What matters is feeling their power. We believe that every wand awaits its complete other half. Each wand on our site and in our inventory is unique and has varying vibration. These are used by spiritual seekers, healthcare professionals, bodyworkers, crystal healers, reiki practitioners, and energy workers of all kinds. They are used in group sessions, in personal meditation, in professional practices, for feng shui, and incorporated in all modalities for well-being. Their use is widespread and is not limited to what we speak. They may be used for meditation, healing and balancing of the physical or etheric body of human, animal, earth energy, or of the ethers. 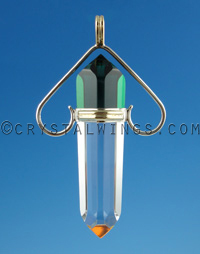 These crystal beings are considered the best and most powerful of their kind.